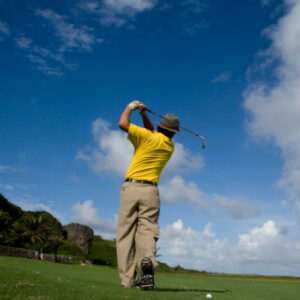 The whole body is involved during the complex movement of the golf swing. Power potential is developed by the co-ordinated efforts of the muscles of the body during the swing. The power is transferred to the golf ball at impact to propel it towards the target. The table below is a summary of the most active muscles in each phase of the swing in a right-handed golfer: Backswing, downswing, acceleration, early follow through and late follow through. By understanding the component parts of the golf swing, and where muscles are most active a golf specific exercise program targeting specific muscles in the specific phases of the golf swing can be developed. Such a program could improve function that may result in improvements in accuracy and distance. Such a program may also reduce the risk of sustaining a golf-related injury. For further information on muscle activity during the golf swing or any other golf injury matter contact Synergy Healthcare today.